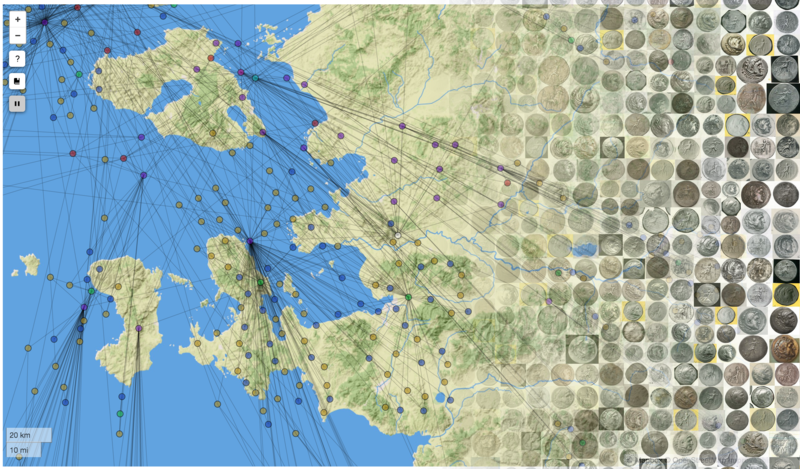 Economic, Material, and Social Networks in Antiquity: Aeolian Alexanders uses social network analysis and historical geographic information systems to analyze the understudied region of Hellenistic Aeolis in western Turkey. The focus of this investigation is a reimagining of a die study investigating Aeolian coinage into a digital publication that illustrates economic and social networks in geographic space. Moving beyond a traditional print medium, this project uses new software and investigative methodologies to examine connections between individual coins, engravers, mints, and their larger role in the Mediterranean world after the death of Alexander the Great. Hosting provided by the Ancient World Mapping Center at the University of North Carolina at Chapel Hill. Built with the Big Ancient Mediterranean framework. Location data and some styling from The Pleiades Project. Uses Nomisma linked data vocabulary.